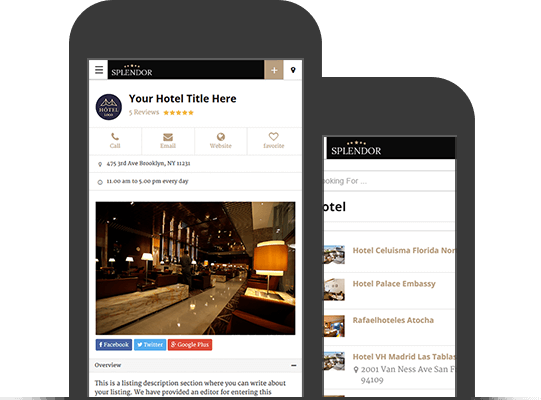 The Splendor hotels directory theme for WordPress enables you to create, manage and monetize an amazing directory for hotels, motels, hostels, lodges, bed and breakfasts or any rental accommodation. 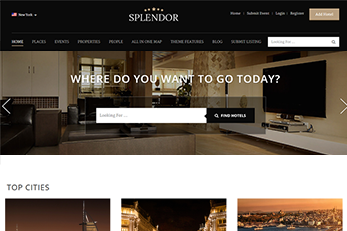 Splendor can also be used as a directory theme for holiday rental villas, apartments or any type of rental properties. You can also use Splendor as a business directory too. 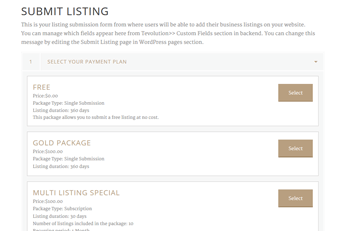 This theme comes with customizable categories, fields, packages and advanced search. Splendor is a highly customizable theme so the choice is yours on what you want to use it for. All the tools for a powerful and professional directory for hotels is at your disposal. 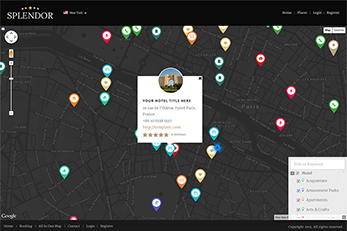 Capture the attention of your visitors, right with the homepage maps. The slider of your homepage will display a powerful searchable homepage map which acts like a hotel finder system. The map shows hotel listings, categories. Users can also use its filter and search options to find hotels.This will be beneficial if you want to use splendor as a theme for hostels, bed, and breakfasts, guest houses, properties etc. It doesn’t matter if you use this theme for a directory for hotels, travel-related businesses or wellness spas, beauty salons or any other business, listing submissions are easy. All a user has to do is to register on your website and submit their listing. As mentioned above, users can also manage their own listings. Can you add listings as admin? Yes, of course, you can add listings from the front-end or from the theme’s admin dashboard. Display a city unique banner on the homepage. 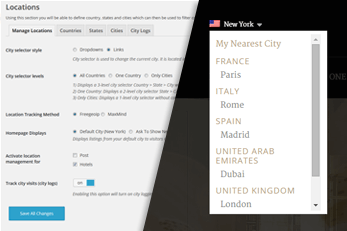 This is ideal if you want to give each city on your directory website its own identity. This option is ideal for whatever type of directory you use the Splendor theme for. 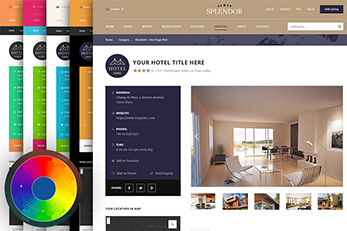 Whether it’s for hotels, hostels, properties, bed and breakfast or even for business listing directories, the Splendor powerful theme is easily adaptable, customizable and is ready to be shaped for your site’s requirements. 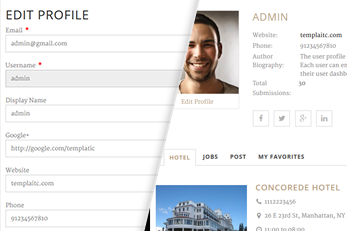 As a hotelier or site admin for a directory of hotels, you can create unlimited custom fields. These gives you options to make the theme ideal for almost any type of directory. New custom fields can be made to show on the listing submission page, category and homepage. You actually have an option whether a field appears on those 3 locations or not. The advanced search is a feature that substantially boosts the user experience of your website. 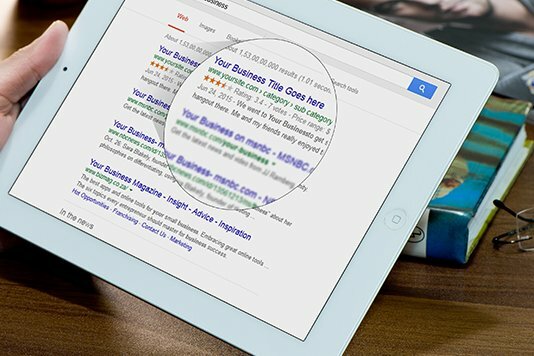 a Users can quickly refine search by location, keyword, category or criteria and many other options. The advanced search widget is designed to also show custom fields you create from the dashboard. 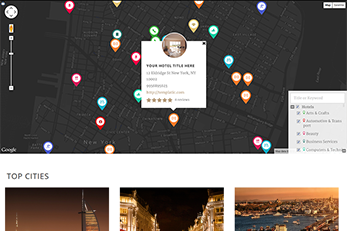 You can define your own submission pricing packages with this Hotel directory WordPress theme.Create free or paid listing packages, single or subscription package types are available. You can also offer recurring type packages, trial periods and featured listing packages. You can create unlimited submission packages to suit your own directory. Create eye pleasing hotel directories by displaying beautiful slider images. 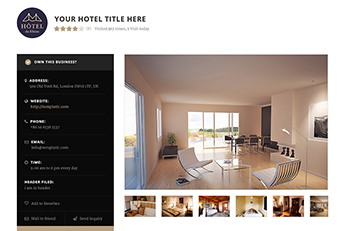 This responsive hotels or properties directory theme comes with an attractive image slider. The theme’s slider can be used to show custom images or display featured images of hotel listings. Add all the categories you want. This powerful and flexible hotel listing WordPress theme comes with various display options for your listing categories. 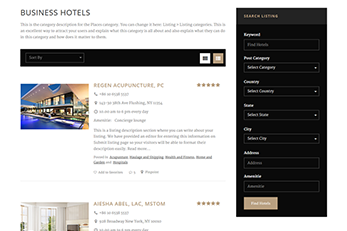 The theme’s hotel listing categories also give your users many sorting options as well as being able to toggle between ‘List‘ and ‘Grid‘ view. Splendor is designed to be an affordable and powerful all-in-one solution hotel finder system. Whether you use the Splendor theme as a hotel master to showcase your hotel and rooms or as a directory for thousands of hotels, the detail pages are designed to be informative to visitors. Detail pages come with listing description and an attractive image gallery, navigational maps and sharing options. You can even create new custom fields to be displayed in your listing. Fields can also be category-specific and will only show if a listing has any of them filled or selected. You can choose what information you want to collect from your users. You can manage the existing user profile fields or add new ones. User fields are great if you as admin would like to collect more information about your users during the registration process. As an admin, you can decide whether a field displays or not on a user’s edit profile page, user dashboard or the registration form. 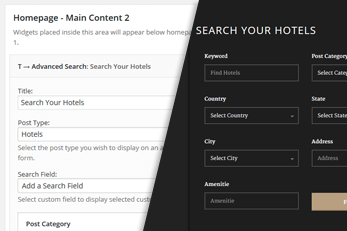 Users can manage their own hotel listing submissions with a powerful user dashboard. This gives each user access to the list of listings they’ve added. Your users can edit, renew or upgrade their own listings. In case you’re wondering, the system does send admin email notifications when a listing is edited by the user who has submitted it. 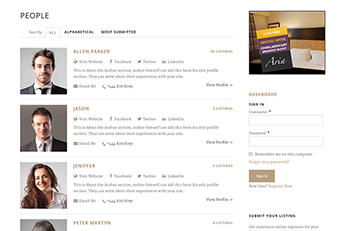 As part of our attractive collection of Hotel WordPress themes, Splendor comes with the ‘People’ page. This can have its name and slug changed to whatever you want and acts as an index of all users who have submitted a listing on your directory website. This is a great way to let visitors see all listings from a particular user in one place. The submitters’ index page also comes with alphabetical sorting or by users with the most number of listings. Visitors can also see a brief description of each user’s submitted listings. 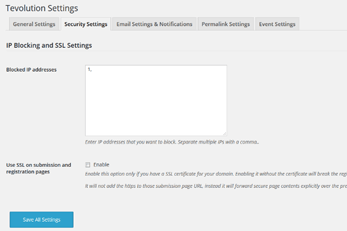 The beauty of this theme’s is not just the fact that you can create new custom fields. As it’s possible not all your categories will be using the same fields. No problem, You can make any one or all of these fields be only applicable to 1 or more listing category. This means your listing submission page can show different fields to users depending on which category was selected. 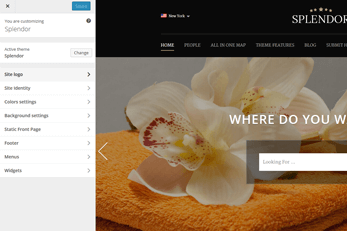 This hotels directory theme comes with many powerful built-in features which let you build an amazing directory website in WordPress. All of the theme’s functions can easily be managed from your admin dashboard. Creating new categories, fields, submission packages, adding new countries, states and cities is all done from the dashboard. As well as this, your admin dashboard comes with many flexible settings and options to make your hotels directory very easy to manage. 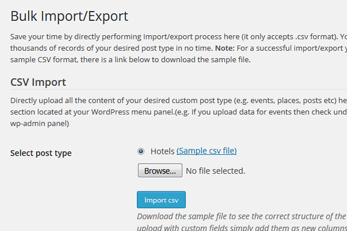 If you want to insert a large number of listings and cities straight to your WordPress directory website you can use our free Bulk Import/Export tool. It lets you use a .CSV file to populate your directory. This is a great tool to quickly and effortlessly add listings or cities to your site as admin. Using .CSV format, adding listings to your site has never been easier. 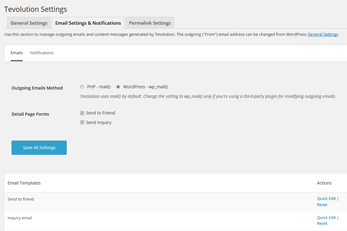 You have options to edit all email templates sent out by the theme. This is done straight from your admin dashboard. Email templates to users and admin include: When a user registers, submit a listing, upgrading a listing, claims a listing, on payments, before a listing expires and many more. Admin also receives an email notification when an already admin approved listing is updated by user. As well as advanced search, Splendor comes with Directory’s Instant Search widget. This is a powerful search which has more options than meets the eye. You can decide which fields the simple search yields results from. You can also choose from new custom fields you create. The Instant Search widget is ideal for simple and quick searches. Your website can display ReCaptcha on all forms which you can enable or disable. Splendor can also be used with our free IP Blocker plugin which is designed to let you block a user from being able to submit listings or even visit your website. This is optional of course so you don’t have to use it if you wish to use other tools to block IPs. Launch your hotel’s directory for the locations you want. 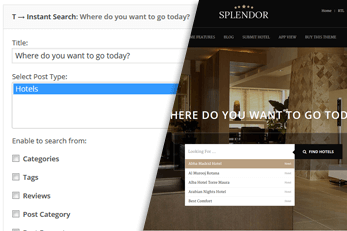 As not all hotel directories will be targeting the same locations, the Splendor theme includes a powerful and customizable location management system. Admin can add or remove existing countries, states, and cities. You are in full control with the theme’s Location Manager. All locations can be edited, deleted or new ones added. You can can change your hotel directory’s default color scheme from simple to the use customizer in your dashboard. This built-in tool comes with color pickers so you’re never limited to any particular colors. This tool also includes an option to add an image to the website’s background. This hotel listings theme can easily be customized without ever having to touch code to make it match your own color scheme. 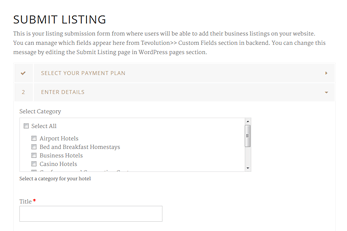 Use WordPress to launch a directory for hotels, hostels, bed and breakfasts, rental properties, accommodation or any other business listings in any local currency. This hotels directory theme comes with a currency changer which lets you enter any other currency to replace the US Dollar if you like. You are not limited in any way and you can enter any other currency and its symbol. This powerful and elegant hotels finder comes with many Google maps. As well as the homepage map widget which you can easily add, Splendor comes with a map on listing details, category and search result pages. You can also link to from your menu and offer your visitors the All-In-One map page. As its name suggests, this is a cool map page which shows all listings on your site on one big map. This elegant and responsive hotels directory theme is not just all about listing owners. 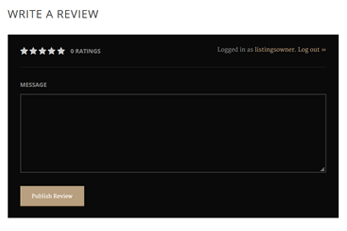 Visitors to your website can also leave ratings and reviews on hotel listings. 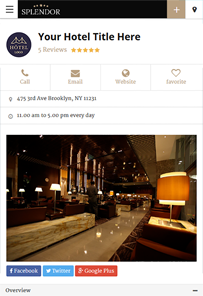 You can use hotel directory script as fully fledged hotel reviews website or of course for any other listings directory. As well as being a responsive theme for hotels, this hotel’s website also comes with a built-in mobile app view. This cool feature lets users see a minimized view when visiting your directory website from any mobile device. The mobile app view is optional and it can be activated or deactivated from theme settings. Splendor is designed to work with free and/or paid listings submissions. 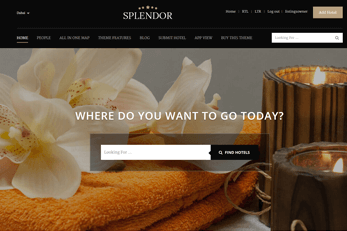 In case you’re after launching a profitable online hotels directory, here are just some of the monetization features you’ll love in the Splendor theme. Create unlimited submission packages to suit your directory’s requirements. Create membership packages where 1 price allows a certain number of listings. 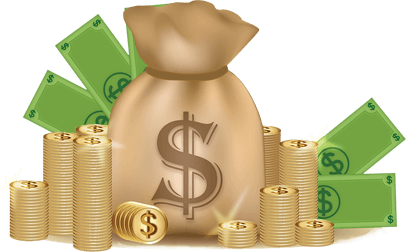 Create recurring payment packages. These are a great as it’s an automatic flow of money. Display banner ads around various areas. Publishing Google AdSense is also possible. Built-in claim listing features. These are optional so you don’t have to activate claims. Charge for featured listings. This status can be as additional charge or part of package price. Charge for specific listings categories. This is optional and it’s a charge which is on top of a package. Create additional custom fields straight from your dashboard. No need to touch code. This hotels directory theme is coded with best SEO practices in mind. You can be sure your site’s good rankings will encourage hotel owners to add listings. The online hotel reservation website template works with the best free SEO plugins available today such as Yoast SEO, All In One SEO, Google XML Sitemaps and All In One Schema.org Rich Snippets plugins. You can translate the Splendor theme into any language you want. To do this, you simply have to apply your translation to the theme’s .Po files which come with it. This theme has also been tested with popular WPML plugin which lets you use it in multiple languages. 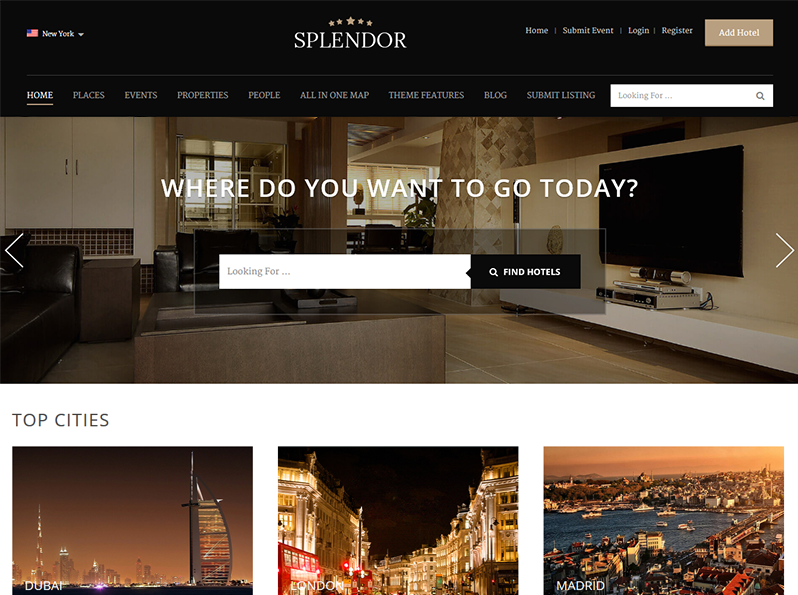 The Splendor hotels directory theme comes with “Easy Install” and sample data. Once you activate the theme, click the “Install sample data” button and your website looks just like the theme’s demo. 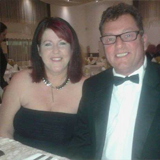 This is a great feature which is designed to help you start your hotel’s directory in no time. As well as all of the the theme’s built-in features you can also purchase any of the 30+ Directory add-on plugins. All of these plugins are optional you’ll get Splendor as you see it on its demo which doesn’t include any additional plugins. 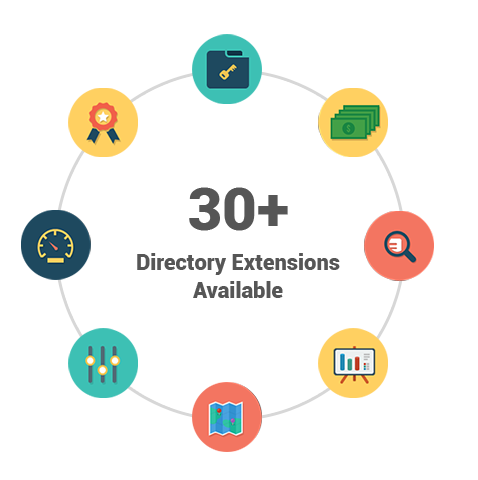 These add-ons are designed to extend functionality of your directory website but none are mandatory. 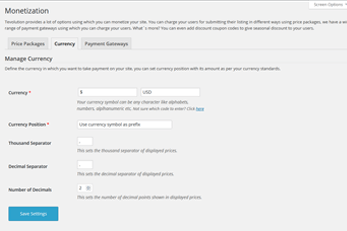 The PayPal payment gateway is included with the Splendor theme. As well as this, you also have the choice of 15+ compatible paid payment gateway add-ons. These optional add-ons help you accept payments with more of some of the other popular payment gateways. Looking to start your online directory for hotels, motels, villas or apartments? Get one of the best hotel WordPress themes available today at a fraction of what it cost to build. 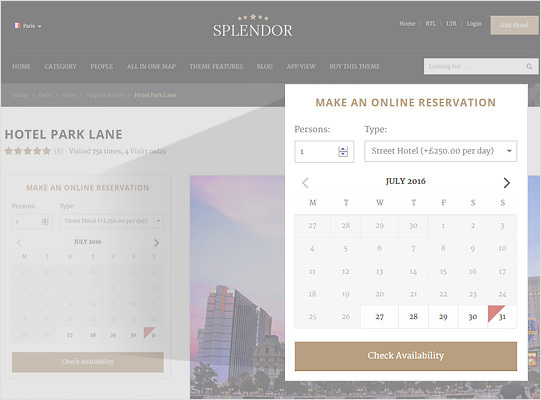 Spledndor is a must-have if you're building that special hotels directory.